The Buddha Myth--A Skeptic's Guide: GANDHARA—LAND OF THE BUDDHA? Loriyan-Tangai. 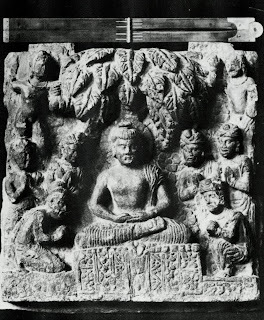 Relief of Buddha surrounded by worshippers. Lahore Museum. Notice Buddha's moustache. Gandhara seems to have taken to Buddhism with surprising speed and vigor, based on the archaeological remains and statuary found there. 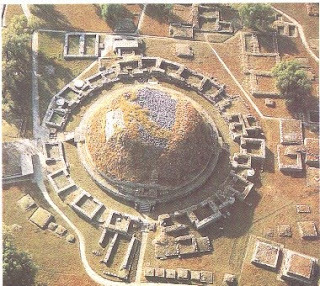 The earliest datable Buddhist sites, Butkara I in the Swat Valley and the Dharmarajika complex in Taxila, near Sirkap, are dated to the early second century BCE. Even conceding that Asoka introduced Buddhism to Gandhara through his missionaries, as per legend, the country would have had to have been converted and its art and culture adapted in response to this new religion within less than two centuries. This would have required a massive evangelical effort, which seems rather improbable in the period before the Common Era, for a religion like Buddhism, where salvation is believed to be achieved through personal striving. The video above, from the BBC series "In the footsteps of Alexander the Great," shows scenes from Gandhara, such as the Swat Valley. From Buddhist Art of Gandhra by Sir John Marshall. Gandhara was the ancient name of the tract of country on the west bank of the Indus river which comprises the Peshawar Valley and the modern Swat, Buner and Bajaur. It was a country with rich, well-watered valleys, clear-cut hills and a pleasant climate: a country where a Greek might well dream of being back in his homeland. Situated on the border between India and western Asia, Gandhara belonged as much and as little to the one as to the other. In the sixth and fifth centuries BCE, it formed part of the Achaemenid empire of Persia. In the fourth it was occupied for a brief period by the armies of Alexander the Great. 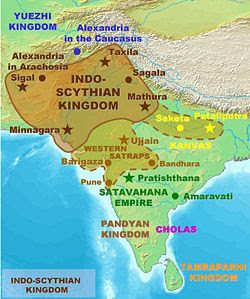 Thereafter it was conquered by Chandragupta Maurya, but after a century of Indian rule the West again asserted itself, and for another century (roughly, the second century BCE) Greek dynasts took the place of India. Then came, early in the first century BCE, the victorious Sakas or Scythians, to be followed, after yet another century, by the Parthians and Kushans. And even then the tale of foreign conquest was not ended. For in the third century CE Gandhara again reverted to Persia, now under Sasanid sovereigns, and was again re-conquered by the Kidara Kushans in the fourth. Finally, the deathblow to its prosperity was given by the Ephthalites or White Huns, who swept over the country about 465 CE, carrying fire and sword wherever they went and destroying the Buddhist monasteries. The people of Gandhara were thoroughly cosmopolitan in their culture and their outlook. Of their physical appearance we get some idea from the old sculptures. Some of the men, with strikingly tall and dignified figures, closely resembled many present-day Pathans, and wore the same distinctive kind of baggy trousers and sleeved coat. Others were characteristically Greek; others just as characteristically Indian. And, no doubt, if we knew more about them, we should recognize other racial elements portrayed by the sculptors. The common speech of the people was an Indian Prakrit [Buddha was said to have spoken Prakrit], but the script they used for the writing of this vernacular was not, as might have been expected, the current Brahmi of Northern India but a script known as Kharoshthi—a modified form of the Aramaic of Western Asia, which had been adopted for official use throughout the Persian Empire during Achaemenid times. [Jesus was supposed to have spoken Aramaic. Link between Buddhism and Christianity?] Other languages and other script were also employed, on occasion, in Gandhara. The coins, for example, normally had Greek legends on their obverse, Kharoshthi on their reverse; but in rare cases the legends were in Brahmi. Brahmi, too, was the usual script employed in the sacred manuscripts of the Buddhists. Nevertheless it is true to say that Gandhara took its everyday speech from India and its writing from the West. The earliest images of Buddha, such as the one above from Gandhara, clearly show him as an Indo-Aryan. This intimate fusion of widely divergent elements was equally apparent in the religious life of the people. As each successive conqueror added his quota to the local gallery of deities and creeds, the number and variety went on growing. In the second century CE the coins of the Kushan kings Kanishka and Huvishka, whose capital was at Peshawar, exhibit a truly amazing gallery of gods and goddesses probably unparalleled elsewhere in the field of numismatics. Most numerous are the Iranian types, including among others the sun (Mioro), the moon (Mao), the wind (Oado), fire (Athsho), war (Orlagno), victory (Oanindo). The names are given in corrupt Greek. Not all these multifarious deities were all worshiped at the heart of the Kushan empire in Gandhara; for they may well have been designed as a means of popularizing the new gold currency in distant parts of the Kushan empire and even beyond its borders, where it was hoped the currency might compete with the Roman aureus. Indeed, the great predominance of Western Asiatic types on these coins suggests that the currency was intended for use in the West rather than in the East. But, however this may be, this gold coinage leaves us in no doubt that the attitude of the Kushans towards religion was as thoroughly cosmopolitan as it was towards other matters, as cosmopolitan indeed as that of the Romans or Alexandrians, and perhaps no less practical. Looking at this coinage one would never guess that in the time of Kanishka and Huvishka Gandhara and the greater part of the Kushan empire were overwhelmingly Buddhist. The beginnings of Buddhism in Gandhara go back no further than the middle of the third century BCE when the Maurya emperor Asoka sent one of his many missions to spread the gospel of his newly adopted faith among his subjects on the Northwest Frontier. [I've argued elsewhere that there is insufficient evidence to maintain that he converted to Buddhism.] Evidence of this mission’s activities may still be seen in the fourteen Edicts of the emperor engraved on the rocks at Shabaz-Garhi in the Peshawar Valley, which set forth the Buddhist principles of religion and ethic, and such simple rules of conduct as Asoka deemed most conducive to the welfare of his people. To Asoka was also due the outstanding importance of the stupa or funeral mound as an emblem and cultural object of worship among the Buddhists. For one of the many acts by which he sought to popularize the Sakya faith was the gift to each of the principal cities in his dominions of a portion of the body relics of the Buddha. These he obtained by opening the seven of the eight stupas in which the relics had originally been enshrined and dividing up their contents. Along with the relics he also presented each city with a stupa worthy of housing them. [On the other hand this could be stuff of myth and legend.] In making these gifts the emperor may well have recognized the value of providing the worshippers with some visible and tangible object on which to focus their thoughts and prayers. But, whatever his purpose, the effect of these relic-stupas was profound and lasting. Not only did the presence of the relics make them cult objects of worship, but in after days the stupa itself, whether it contained a relic or not, was worshiped for its own sake; so that the mere erection of a stupa large or small and in whatever material, became an act of merit, bringing its author a step nearer salvation. [Not true; in Buddhism, doing good actions can never lead to salvation. “Whoever shall do nothing but good works will receive nothing but excellent future rewards.” The aim of the disciple is not to accumulate merit, but to win insight.] This matter of the stupa cult deserves our particular attention because it was on the adornment of the stupa that the early Buddhists lavished the wealth of their sculpture, and stupas, sometimes richly decorated, figure prominently among the reliefs of Gandhara. By the side of some of his relic-stupas Asoka also erected tall pillars of stone, crowned by lions or other symbolical animals and usually inscribed with one or more of his Edicts. These, too, came to be looked on as characteristic emblems of the Buddhist Church, and are frequently to be seen portrayed in the sculptured panels of the Early Indian and Gandhara Schools. The finest of the pillars were executed by Greek or Perso-Greek sculptors; others by local craftsmen, with or without foreign supervision. How Buddhism fared under the Greek princes of the Northwest during the second century BCE is largely a matter of inference and surmise. For among the myriads of Buddhist monuments and antiquities that have survived until the present day there is not one that can be referred with certainty to Greek authorship in the second century before our era. Indeed, the only positive bit of information about this Greek period that we possess is the story told in the Milindapanha about King Menander (reigned circa 140--110 BCE) and his conversion to Buddhism by Nagasena. Though the story may be largely apocryphal, there is no reason for doubting its substantial truth. The Greeks were very open-minded about religious matters; and the teaching of the Sakyamuni, by its essentially ethical character, by its logical reasoning, and by the stress it laid on free will and the observance of the golden mean, was bound to make a strong appeal to the Greek intellect. [This supports my thesis that Buddhism was an invention of the philhellenic Sakas or Scythians and not the invention of a Vedic mind.] Moreover, from a political point of view Menander must have had the strongest reasons for identifying himself with the Buddhist Church in its struggle against their common enemy, the Sunga king Pushyamitra, and the violent Brahmanical reaction championed by him, which had led to the wholesale destruction of Buddhist monasteries in the Eastern Panjab. 518—515 BCE. Conquest of the Indus valley by Darius I. By shunting Buddha’s date forward by about a century, India’s first certain (more or less) date becomes the conquest of the Indus valley by Darius I, he whose far-flung battles included defeat at Marathon by the Athenians in 490 CE. Before this, Darius had evidently enjoyed greater success on his eastern frontier; a Persepolis inscription, dated to circa 518, lists amongst his numerous domains that of ‘Hi(n)du.’ An earlier inscription also refers to ‘Gadara,’ which looks like Gandhara, a mahajanapada or ‘state’ mentioned in both Sanskrit and Buddhist sources and located in an arc reaching from the western Panjab through the northwest frontier to Kabul and perhaps into southern Afghanistan (where ‘Kandahar’ is the same word). According to Xenophon and Herodotus, Gandhara had been conquered by Cyrus, one of Darius’ predecessors. 448/480 BCE. Birth of the Buddha (high and low range). 368/405 BCE. Death of the Buddha (high and low range). 331—327 BCE. Alexander the Great (ruled 336-323). 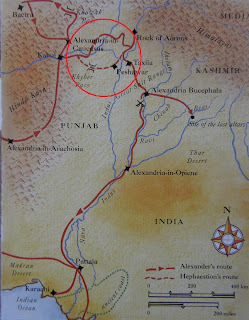 Alexander's Indian campaign follows not long after Buddha's death. He is in Gandhara, conquers Taxila, and arrives at the Indus River. The Indian king Porus on his war elephant, attacked by Alexander on horseback, a coin struck by Alexander to celebrate his victory in 326 BCE. 322 BCE. The rise of Chandragupta Maurya. 313—312 BCE. Chandragupta Maurya king of Magadha / Megasthenes at the court of Pataliputra, identified as modern Patna. But according to Dr. Ranajit Pal, this is incorrect. See A New Non-Jonesian History of the World. 200 BCE. The first Buddhist sites are founded in Gandhara, but no religious imagery is known from this period, (Butkara I, Swat valley and Dharmarajika, Taxila). The few Asokan rock-cut edicts that remain in Afghanistan and Pakistan do not directly address the introduction of Buddhism into Gandhara; many scholars have nonetheless considered them evidence of the beginning of Buddhism in the region. [If Asoka had introduced Buddhism to Gandhara, wouldn't he have boasted about it on his rock-cut edicts?] Not until the early second century BCE, however, was the earliest datable Buddhist site, Butkara I in the Swat Valley, founded in Greater Gandhara. The only other Buddhist site in Gandhara that can be attributed to the second century BCE is the Dharmarajika complex in Taxila, near Sirkap. circa 168 BCE. King Menander (reigned circa 140--110 BCE) withdraws from the Magadha to the Panjab (until circa 145). According to Dr. Pal, Magadha is not modern Bihar; if it was it would mean that the Indo-Greeks controlled territory all the way to east India. Menander, Bactrian Greek philospher-king of northwest India. circa 150 BCE. The stupas of Bharhut and Sanchi / The Buddhist philosopher Nagasena / The Milindapanha. Sanchi, Great Stupa, seen from the east, before 'restoration'. circa 130 BCE. Invasion of Bactria by the Yuezhi tribe. circa 90-80 BCE. Invasion of the Sakas (Indo-Scythes) / Collapse of the Greco-Bactrian kingdoms. circa 70 BCE. The vedika of Bodh Gaya. Shrine and monastery of Bhaja. circa 30 CE The toranas of Sanchi. 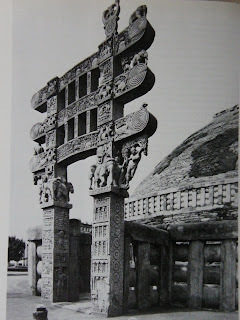 One of the four carved gateways (toranas) of the railings with which the Great Stupa at Sanchi was embellished. circa 78 CE. The Saka era. The Kushanas extend their power in India. 1st century CE. First appearance of sculpture embellishing Buddhist sites (Gandhara). circa 125 CE. Completion of the Ramayana and compilation of the Mahabharata. / The Begram site in Kapisa / Drafting of the Bhagavad Gita / The dramatist Asvaghosa. circa 144—185 CE. Accession and death of king Kanishka. Coin of Kanishka, Pakistan, ancient region of Gandhara. A coin of Kanishka depicts, on the obverse, the king standing and facing left; he has a full beard and wears a pointed hat and heavy felt coat, a mode of dressing similar to that of Parthian kings, which marks him as coming from a land outside South Asia. Kanishka reaches out with his right hand to make a sacrifice at a low altar; in his left hand he carries a spear. Flames issue from his right shoulder, indicating his superior natural powers. The reverse of the coin shows a four-armed Shiva, a Hindu god, who is wearing a dhoti (loincloth) and holding a vajra (a weapon), and ankusa (elephant goad), a trident, and an antelope by the horns. No aspect of this coin's iconography makes reference to the Buddhist faith, which is especially significant since later Buddhist text sources refer to Kanishka as a great Buddhist king, equal only to Asoka. Kanishka did mint coins with images of Buddha on the reverse, but he also had coins produced showing a range of other South Asian (Hindu) and Near Eastern deities, associating his portrait with various gods venerated by the people of his realm and by his Near Eastern trading partners. 1st—3rd century CE. Kushan dynasty controls much of Greater Gandhara and north India, reaching the zenith of its power under kings Kanishka (ruled CE 129-155) and Huvishka (ruled 155-193). 2nd century CE. Period when many Buddhist sites are founded and when most Gandharan Buddhist native sculpture is produced. 3rd century CE. Devotional icons of the Buddha and bodhisattvas begin to be sculpted. Schist remains an important medium, but clay, stucco, and terracotta start to be widely used. Before 200 (?) The Buddhist philosopher Nagarjuna. Before 300 (?) The sites of Nagarjunakonda and Goli. circa 375—circa 414. The most splendid of the Ajanta caves / The philosophers Asanga and Vasubandhu / The poet and dramatist Kalidasa. 3rd—5th century CE. Period of greatest prosperity in Gandhara; new Buddhist sacred sites are founded and older ones are greatly expanded. Most Gandharan Buddhist iconic sculpture is produced during this period. Massive rock-hewn Buddhist caitya at Mes Aynak, Ancient Gandhara. 4th—5th century CE. Devotional icons become monumental, and the iconography of Buddha images becomes more complex. 5th—6th century CE. Various Hun people take control of Gandhara. There is a gradual decline in donor patronage to Gandharan Buddhist sacred areas; as they contract, Buddhist communities re-use older sculpture. 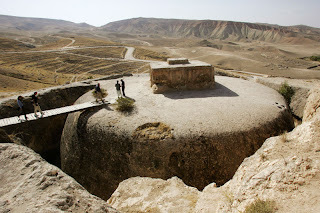 Early Chinese pilgrims, for example, considered the relics at sites in Afghanistan and Gandhara, rather than the sacred sites of north India, the culmination of their travels through Central Asia.